Home / SURPLUS, military and civilian. / MIlitary surplus by country. 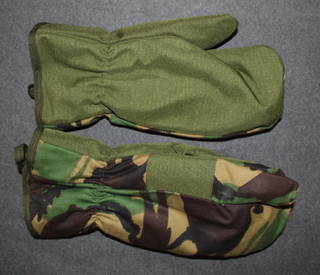 / MK3 Arctic Inner mittens DPM, UK army. Trigger / smartphone finger. Issued / unissued Cold Weather mittens with trigger finger. Thick, very comfortable mittens, suitable for cold weather, even in finnish standards, and the trigger finger is thin enough for smartphone or other touch screen use, depending of model ( tested, works on iPhone). While MK2 had soft cotton outer shell, MK3 has heavy cordura palm, that should not wear easily. MIttes are used, some very little some have visible signs of wear, all are usable and divided in to two qualities. Completely unissued fresh out from box are also available. Some of the used have black friction dots, some do not have them, that depends from year of manufacture.